Free download Zuma’s Revenge game for PC. It is a puzzle game for your PC. Zuma’s Revenge is sequel of Zuma Deluxe game. 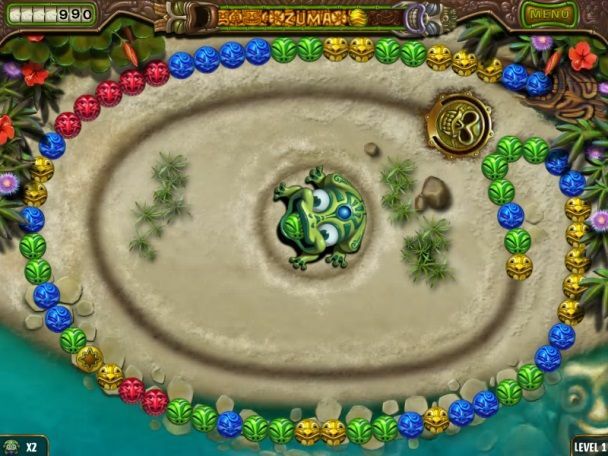 This game is developed by PopCap Games of Electronic Arts Inc. Zuma’s Revenge game is played with the help of mouse. Zuma’s Revenge is available free for 60 minutes. This is a trial version that can be downloaded from the given link below. After downloading, install the game by running the downloaded setup file. This will take about a minute and the game will be started. You will see the main screen with two yellow buttons. These are Play Trial Game and Buy Now. You can start the game by clicking on “Play Trial Game” button. The game will start some time to load and ask you to enter your name. After entering the name, you are ready to play Zuma’s Revenge game on your PC. Zuma’s Revenge game is controlled by mouse only. You have to make a click to continue or proceed to next step. May be you could not see the mouse pointer on game screen but it is not a mater. You can click anywhere or move the mouse toward the button that will be highlighted when reach on button. To move the Zuma, move the mouse and press click to throw the ball. You have to hit the ball towards the matching color’s balls. If there are more than two balls, you can destroy them. There are continuously coming balls adding into the row. You have to stop these ball to enter the house. If you break the ball’s row from center, the next row from the destroyed part will stop until the tail part join it. Try to hit the tail part to stop it. When you destroy all balls, the round will be cleared.